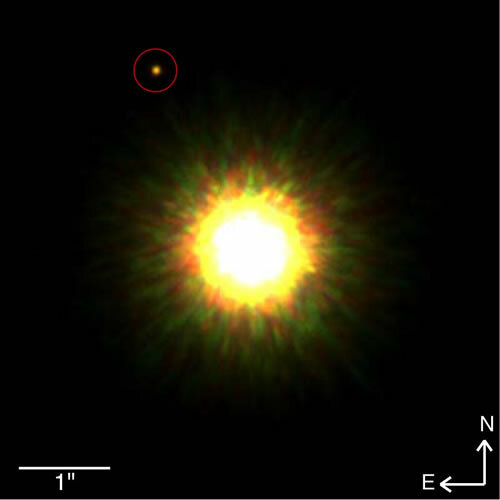 Astronomers have unveiled what is likely the first picture of a planet around a normal star similar to the Sun. Three University of Toronto scientists used the Gemini North telescope on Mauna Kea in Hawai‘i to take images of the young star 1RXS J160929.1-210524 (which lies about 500 light-years from Earth) and a candidate companion of that star. They also obtained spectra to confirm the nature of the companion, which has a mass about eight times that of Jupiter, and lies roughly 330 times the Earth-Sun distance away from its star. (For comparison, the most distant planet in our solar system, Neptune, orbits the Sun at only about 30 times the Earth-Sun distance.) The parent star is similar in mass to the Sun, but is much younger. Until now, the only planet-like bodies that have been directly imaged outside of the solar system are either free-floating in space (i.e. not found around a star), or orbit brown dwarfs, which are dim and make it easier to detect planetary-mass companions. The existence of a planetary-mass companion so far from its parent star comes as a surprise, and poses a challenge to theoretical models of star and planet formation. "This discovery is yet another reminder of the truly remarkable diversity of worlds out there, and it's a strong hint that nature may have more than one mechanism for producing planetary mass companions to normal stars,” said Ray Jayawardhana, team member and author of a forthcoming book on extrasolar planets entitled Worlds Beyond. The team’s Gemini observations took advantage of adaptive optics technology to dramatically reduce distortions caused by turbulence in Earth’s atmosphere. The near-infrared images and spectra of the suspected planetary object indicate that it is too cool to be a star or even a more massive brown dwarf, and that it is young. Taken together, such findings confirm that it is a very young, very low-mass object at roughly the same distance from Earth as the star. Even though the likelihood of a chance alignment between such an object and a similarly young star is rather small, it will take up to two years to verify that the star and its likely planet are moving through space together. “Of course it would be premature to say that the object is definitely orbiting this star, but the evidence is extremely compelling. This will be a very intensely studied object for the next few years!” said Lafrenière. Near-infrared spectra of 1RSX J160929.1-210524 and its candidate companion. The primary's spectrum (row A) is as expected for a temperature of about 4000 K (spectral type K7). The candidate companion's spectrum (black curves repeated in rows B--F) is compared with the spectra of two young brown dwarfs (red curves on rows B--C; spectral types M9 and L1) and two older, cooler brown dwarfs (red curves on rows D--E; L3 and L6. The `triangular' shape of the left part of the companion's spectrum is in much better agreement with the two young brown dwarfs, indicating the candidate companion has low gravity; in turn, this implies it has not yet fully contracted and thus is still young. The companion spectrum and those of all comparison objects have been normalised to be the same on the right-hand side. The fact that, compared to the young brown dwarfs, the candidate companion is slightly fainter in the left-hand part *indicates that it it is cooler*, more like the field L3 brown dwarf. The comparison with models (row F) confirms that the companion has low gravity, and thus is young. The Jupiter-sized body has an estimated temperature of about 1800 Kelvin (about 1500ºC), much hotter than our own Jupiter, which has a temperature of about 160 Kelvin (-110ºC), and its likely host is a young star of type K7 with an estimated mass of about 85% that of the Sun. For more characteristics of the star and planet see this table from the paper. The work that led to this discovery is part of a survey of more than 85 stars in the Upper Scorpius association, a group of young stars formed about 5 million years ago. It uses the Gemini telescope's high-resolution adaptive optics capabilities to determine the different types of companions that can form around young stars: stars, brown dwarfs, or planetary mass objects. “This discovery certainly has us looking forward to what other surprises nature has in stock for us,” said Van Kerkwijk. The ADS link for the paper is here.